One of the biggest drawbacks of budget Android devices tends to be the cameras. Cameras are expensive, and downgrading to lower-quality cameras is an easy way to keep the price down on smartphones. But what if you want the power of a solid camera in a cheaper package? Enter, the Ulefone T1. It’s a brand that is relatively unknown in the US, but it could give other manufacturers a run for their money. The Ulefone T1 rests in-between the low-tier and mid-tier ranges, and while it makes some sacrifices, it also does a few things pretty well. Read on to see why you might want to give the Ulefone T1 a chance – and end the end of this review, we’ve got one to giveaway. 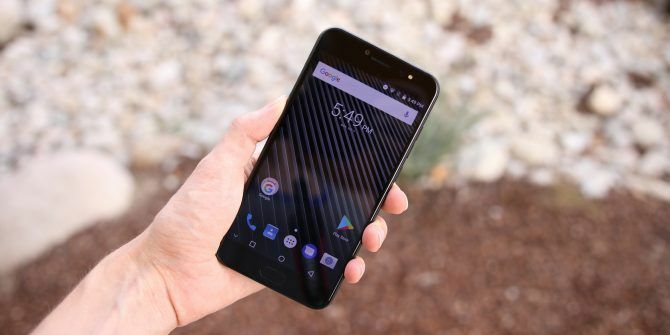 The first thing you’ll notice about the Ulefone T1 is that it looks painfully similar to the OnePlus 5 OnePlus 5 Review: Seriously, This is the Best Android Right Now OnePlus 5 Review: Seriously, This is the Best Android Right Now This is the best Android phone on the market. It has a solid design, amazing cameras, intuitive software, and it's cheaper than other flagship devices. Read More . The biggest difference is really that the Ulefone T1 is a bit thicker and doesn’t feel quite as smooth around the edges. It definitely gives off the impression of being a OnePlus 5 knockoff. It’s about half the price of a OnePlus 5, but manages to pack in similar specs. Still, don’t expect the experience to be at the OnePlus’s level. To make a cheaper device, they had to cut some corners. The screen is definitely one of those corners. The 1080p resolution is fine, but it just looks like a much lower quality than other modern smartphones. It feels like you’ve gone back in time a few years. Blacks are nowhere near black, and everything just feels a bit washed out. Just under the display is a fingerprint scanner, which is pretty fast. Thankfully, this device uses software keys, so you don’t have to worry about capacitive buttons. The body itself is sturdy, and actually a bit heavier than other smartphones of this size. It has the power button and volume rocker both on the right side, the headphone jack up top, the microSD card slot and nano SIM card slot on the left, and the USB Type-C port and a lone speaker at the bottom. While it has the appearance of dual speaker, the left one doesn’t produce any sound. You can practically mute the device by just placing a finger over the right speaker. It reaches an average volume, but sounds noticeably lower-quality than most other smartphones. The metal body does feel well-built, even if it doesn’t quite capture the slim elegance of the OnePlus 5. I really enjoy this kind of build because it avoids fingerprints and looks premium. And the back of the device has the Ulefone brand name in the center, with the dual cameras at the top. There are also iPhone 6-esque stripes along the top and bottom of the rear of the device. Those dual cameras are supposed to capture great bokeh shots — where the background around a subject is blurred out — but the result just isn’t there. It doesn’t detect the edges of the subject much at all, instead just putting a circle of non-blurriness around the subject and blurring the rest of the photo. It looks rather strange and unprofessional. There are also your other standard photos modes like a Pro mode, a Beauty mode, and a Panorama. It even has a feature called “Live Photo”, which I would assume is supposed to work like the iPhone’s Live Photos How to Get the iPhone's "Live Photos" Feature on Android How to Get the iPhone's "Live Photos" Feature on Android With iOS 9, the iPhone can now take "Live Photos", but how can you do this on your Android phone or tablet? Read More , but on my device at least, it didn’t work at all. The Live Photo mode would just take a normal picture, and then in the Gallery, it would display with a “dynamic photo” label with a frozen loading symbol beside it, but nothing more. Moving on to the front camera, at 8MP it really isn’t too bad. There’s even a front-facing flash in case you’re in a dimly-lit area. Overall, the camera setup is pretty good for this price range, but it can’t compete with higher-end devices. Ulefone’s modified version of Android 7.0 Nougat looks almost nearly stock. The major exception is the overly transparent notification shade. It looks weird and tacky. Other than that, not much has changed. There’s an app drawer that swipes horizontally, page-by-page, and the Settings menu looks aesthetically pretty stock. However, there is a Smart Assistant section that allows for a few customizations and tweaks. You can tinker with the LED notification light — though your color options are limited to red, green, or blue. You can enable some gestures, like double-tap-to-wake, and you can record your screen. There’s also a task killer built-in (we don’t typically recommend those Why RAM Boosters and Task Killers Are Bad for Your Android Why RAM Boosters and Task Killers Are Bad for Your Android At first glance, RAM boosters and task killers sound incredibly useful, but a closer look shows that they could actually be harming your phone instead. Read More ), an “eyebrow mode” for filtering blue light What Is a Blue Light Filter and Which App Works Best? What Is a Blue Light Filter and Which App Works Best? These blue light filter apps for Android will help you get a better night's sleep, even when using your device at night. Read More , and the option to rearrange the navigation bar. Like other budget Chinese devices like the Leagoo T5 Leagoo T5 Review (and Giveaway!) Leagoo T5 Review (and Giveaway!) If you're looking for a super cheap smartphone, the Leagoo T5 is certainly worth your consideration, despite its drawbacks. Read More , the Ulefone has the option to keep an arrow on the far-left side of the navbar for hiding it. You can also tweak the fingerprint scanner to make it more of a navigation key. It can’t full on replace your navbar like the OnePlus 5’s fingerprint scanner, but it came come close. You can set a short-tap function and a long-press function. So theoretically you could set the short-tap function to return home and the long-tap option to multitask, but you’d still need to use the navbar to access the Back function. Aside from those tweaks, you’ll also found a few old-looking apps in the Ulefone’s repertoire. There’s a music player, a compass, a sound recorder, and an FM radio app. There’s even the ancient Browser app, which has long been replaced by Chrome. One of the weird quirks about the overall software experience is how big everything is. The DPI is huge, which makes everything on the screen, from the status bar to the images on websites, look enormous. And there doesn’t seem to be a built-in way to change this. Also, the navbar itself is unusual. The icons are larger than normal, but the bar is smaller than normal, which leads to the buttons barely having any breathing room around them. I suppose it’s efficient with the usable space, but it looks too squished. The MediaTek processor here obviously can’t compete with higher-end Snapdragon processors, but it still pulls its weight. Playing most kinds of games 10 Best Free Android Games of the Year 10 Best Free Android Games of the Year Did you miss out on an Android game that you should be playing? Our end-of-year roundup is a handy checklist to know what your thumbs should be tapping on. Read More went off without a hitch, and there was minimal lag while multitasking. The 6GB of RAM certainly ensures that you’ll never have problems multitasking. By far the largest performance issue I ran into using the device was the scrolling not feeling as fluid as it should. For instance, scrolling in the Settings app seems to move super quickly, but scrolling in websites in the Browser app seems to be relatively slow. It makes scrolling kind of unpredictable and ruins the overall experience. And that might be related to the delay in pulling down the notification shade from the status bar. It feels like it’s lagging a bit behind your finger, but makes the phone feel much lower-end than other snappy devices. It’s something you can live with, but it is annoying. Thankfully, the Ulefone T1 should be able to achieve fast data speeds around the world. It has an excessive number of LTE bands, including the proper ones for functioning in the US (which is rare for a budget Chinese phone). Pop in your GSM nano SIM card, and you should be good to go. Power by a 3680mAh battery Keep Your Android's Battery Healthy With These Tips Keep Your Android's Battery Healthy With These Tips Software and apps can only go so far -- what about how to charge and discharge your battery? Learn all the tricks here. Read More , the Ulefone T1 just keeps on going. I think there may be some software tweaks holding it back from reaching a whole two-day charge, but it stretches further than a day in most cases. Its battery far surpasses the standard 3,000mAh batteries that we see in most other devices nowadays. Plus, it uses USB Type-C and has MediaTek’s quick charging technology built in, which can get it from 0% to 100% in less than an hour and a half. That’s quite the feat considering many other phones around this level are sticking with the older microUSB. Should You Buy the Ulefone T1? While Chinese phone manufacturers flood the market with sub-$150 devices, I’m just not sure the Ulefone T1 does enough to justify the extra price. It has a decent build quality, battery, and cameras, but the software leaves a lot to be desired and the screen is lacklustre. That being said, the fact that it actually has the correct LTE bands for the US means that this is really a contender for Americans who want a cheap-ish device with USB Type-C, solid battery life, and decent cameras. If you can live with some of the downsides, the Ulefone T1 might be a good choice for those who want a budget device that isn’t just a throwaway. Explore more about: Budget, MakeUseOf Giveaway. Linedock: The Best MacBook Pro AccessoryWhat Can Google Photos Assistant Do for You? I've had T1 ULEFONE for a month and it is a good phone. As stated, camera is not as good as other phones but for general use it is fine. At the end of the day, with lite use, the battery seems to end up at 40% level. Probably good because lithium battery will last so much longer when not charging from a full discharged state. I think it's a good value for the price. Thanks for the write up, it was accurate. Love this website and pages. Great information. What's the purpose of this drivel to compare Ulefone T1 with another product with a price factor of 2x? Next time it will be a promo for OnePlus versus iPhone X? KIA Forte vs. Camaro? Sheesh!